Creative's 'Zii' brand of wireless speakers have taken numerous shapes over the years. The Creative Ziisound D3x takes the appearance of a sound bar, or an iPod dock without the iPod. Its rather subdued look – there are just three controls on the front (Connect, Link and volume) – hides a rather more complicated device. 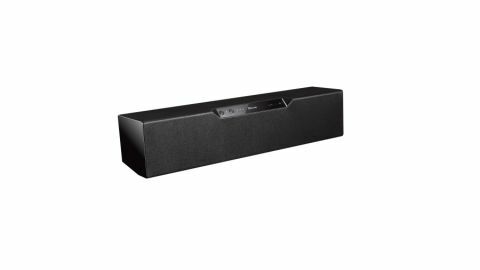 On its own it is a simple Bluetooth soundbar. Connecting a device such as an iPhone is very easy. Pressing and holding the 'Connect' button made the Creative Ziisound D3x discoverable, then pairing it with an iPhone was a simple method of turning on Bluetooth and clicking on the Creative Ziisound D3x's name. We didn't even need to enter a passcode, though some devices might ask you to enter in the default 0000 code. Once connected the sound was good, and the diminutive bar was capable of decent volume. There was a decent bass prescience – not enough to shake the walls, but enough to give the music some depth. Elsewhere, the music was slightly flat, and as you'd expect from a single speaker bar, the lack of stereo made for a slightly claustrophobic feel. However, this is where the Creative Ziisound D3x's deceptively simple design comes into play. You see, the 'Link' button allows you to connect a further two Creative Ziisound D3x units, so you have a left, centre and a right speaker. You can also add a wireless sub-woofer to increase the sound quality. So what we have here is an easily scalable wireless sound system that you can add to as you see fit. However, at almost £120 a unit, getting three of them and a subwoofer is going to end up being very expensive, and you'd be better off buying a complete setup. It also means that if you just buy the one, you kind of feel like you've spent £120 on a third (or quarter) of a speaker setup. There's no rechargeable battery either, which makes the single bar on its own less useful. Overall, this is a nicely designed, and well built, wireless speaker, but struggles to justify its price tag.